John 5 and the Creatures are ready to level the Earth with a sonic-beam of shred with their new record Invasion. For the first time ever, the legendary guitar god sits down to teach you how to play three of his brand new songs in this APTV world exclusive. 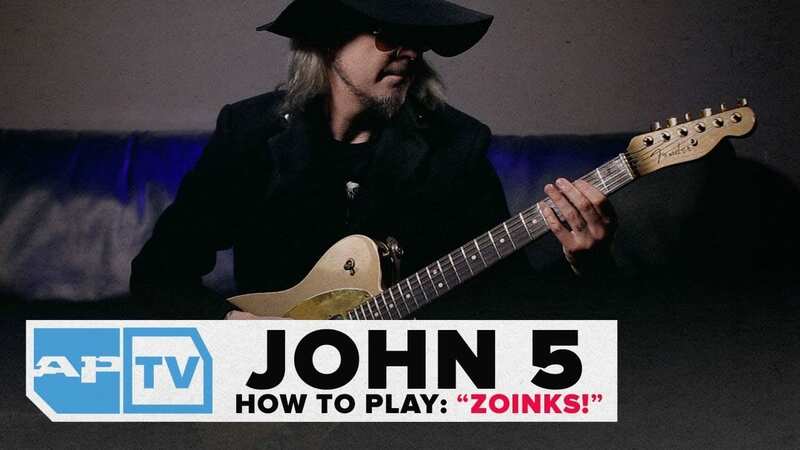 In these installments, he plays through “Zoinks!,” “I AM JOHN 5” and previews a brand-new song. If you’ve ever wanted to play like John 5, these videos are a must-watch. In this installment, he plays through “Zoinks!” and breaks the lead riff down to chord shape and rhythm and explains everything you need to know to play along with the new album. In this APTV exclusive, he demonstrates how to play riffs from “I AM JOHN 5” and explains everything you’ll need to know to play along to the track. The guitar legend also opens up about how being open-minded to all genres keeps his music fresh. In this video, the guitar god teaches you how to play riffs from his new song “Crank It-Living With Ghosts.” Learn the chord shapes, picking pattern and rhythm to this haunting riff-fest. He also gives a preview of a brand-new song and tells us what we can expect for the upcoming music video, gives an in depth explanation of the “Crank It” writing process and discusses the importance of rhythm in his playing. John 5 is currently on tour with dates below and tickets available here.